The objective of the JCN Justice Cooperation Network project is to develop a European network for best practice ‎of ‎‎transition management of prisoners leaving custody with a focus on high risk ‎offenders. ‎This includes the development of reports as well as of a model for handling high ‎risk offenders. 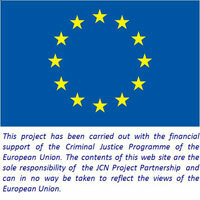 The project JCN Justice Cooperation Network is funded by the European Commission in the framework of the Criminal Justice Programme. Development of a common and mutual understanding of definitions in the field of high ‎risk offenders ‎and transition management. Analysis of the existing ‎programmes in the partner countries and identification of best practice. Development of a model and standards for handling high ‎risk offenders. Sharing the findings of the project with countries beyond the project partners. Workshop 2 (Dublin, Ireland): to compare existing systems of transition management in the partner countries. Workshop 3 (Helsinki, Finland): to identify best practice. Workshop 4 (Schwerin, Germany): to develop a model for handling high risk offenders. Report entitled “Common Understanding of Terms and Definitions” on the topic of high risk offenders and transition management. Report entitled “Transnational Comparative Analysis of Transition Management Strategies”. Report entitled “Best Practice Strategies and Programmes for dealing with high risk offenders and for the desired continuity of treatment as well as for transition management”. Model and Standards for handling high risk offenders.